In a perfect world, Caique pairs will lay their eggs, every egg is fertile, every fertile egg hatches, and perfect parents rear their young. The reality is that some pairs will destroy eggs or even hatched chicks. Even after repeated chances, some pairs will never learn to properly rear their chicks. For this reason we must be prepared to step in and take over. Whenever possible, eggs that are to be pulled for artificial incubation are incubated for a minimum of 12 days under parent birds, or in the case of egg breakers, under foster parents.. This ensures a hatchability rate of close to 100% as compared to eggs artificially incubated from the day they are laid. At Shady Pines Aviary we incubate in an Alpha-Genesis model 2200 from China Prairie Company. 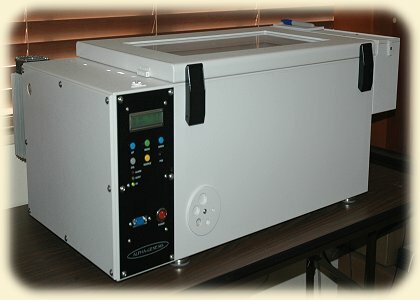 While there are several smaller, less expensive incubators on the market, we have come to appreciate and depend on the many fine features built into this unit such as the battery backup and high and low temperature alarms. Our Caique eggs are incubated at 37.3°C and at 50% humidity. This temperature, the equivalent of 99.2°F, is lower than the recommended 99.5°F Each incubator is calibrated differently and we have found that this temperature works best for us. The automatic turner is set to automatically turn the eggs every 4 hours, in addition we give a manual 1/3 turn twice each day. Eggs are candled daily using a Brinsea Cool Lume . Eggs in drawdown are closely monitored and as soon as they externally pip, they are moved to the hatcher. 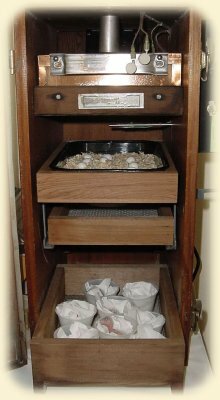 For hatching, and brooding for the first 5 days, we use a converted Humidaire Incubator, model 20. Sadly, after about 60 years, Humidaire is no longer in business, but many of their incubators can be found on the secondary market. Parts are also available from various sources so they can be kept running forever! 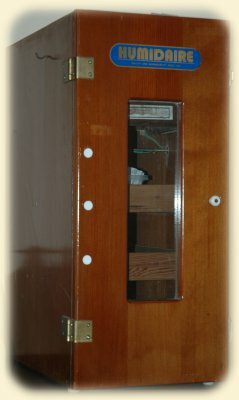 We have removed the turning mechanism and installed stationery rails for the upper two trays. Temperatures in this unit range from 98.7°F on the top shelf down to 97.3°F on the lowest shelf. Humidity is kept between 70 - 80%. The eggs are placed in a small container on the top shelf in a bed of pine shavings where they remain until hatched. A newly hatched Caique chick weighs from 4.5 to 7 grams with the White-bellied being at the heavier end of the scale. They require precise brooding temperatures and frequent feedings if they are to survive, especially in the critical first 5 days. Each year during breeding season I get dozens of calls and emails from folks faced with having to rear a baby Caique from day one. I keep new hatchlings in a brooder at 97.3°-98.3° for the first 5 days and with very high (70-80%) humidity. This temperature is very critical. Babies that are not kept warm enough cannot properly digest their formula giving the impression the baby is not ready to be fed. This will result in fewer feedings which can lead to malnutrition and stunted growth. Babies kept too cool expend energy and calories trying to keep warm, which also contributes to stunting. While there can be many medical reasons for stunting, classic stunting syndrome in otherwise healthy birds is caused by lack of adequate nutrition. Visual signs include a mal-proportioned body with the head appearing large in proportion to the body, reduced fat deposits and muscle mass, toes and wings appear thin; and pale skin color. During the first days they are initially being fed as often as every 1.5 hours, gradually increasing the time between feedings as the quantity fed also increases. I will allow them to go 3 to 4 hours during the night and back to the regular schedule throughout the day and evening. My rule of thumb has always been, if the baby is crying, and nearly empty, it is time to feed regardless of how long it has been since last feeding. The formula is the same Kaytee/CéDé mixture used for all babies but very slightly thinned for the first few days. The consistency is like heavy cream - not at all watery, which can lead to aspiration. By the third or fourth day the formula is full thickness, like loose pudding. Feeding formula too thin not only increases the risk of aspiration, but can also lead to stunting due to inadequate nutrition. On day 5 they are moved to the next brooder which is maintained at about 93°-94°. Again, the time between feedings is increased along with the quantity fed. By 2 weeks they are usually being fed 4-5 times daily. At three weeks they are moved to the next brooder and continue on a schedule like nest hatched babies.